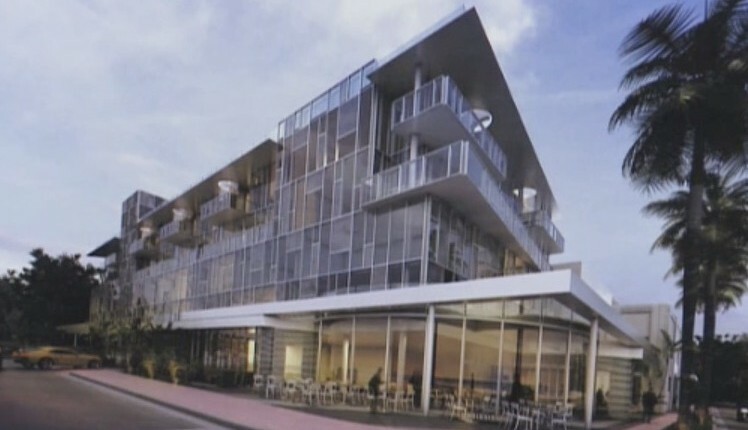 The owner of the Sterling Building on Lincoln Road, home to Books and Books, wants to build an addition that would accommodate hotel rooms and connect Lincoln Road to Lincoln Lane to the north. In order to make the project economically feasible, he wants Miami Beach to eliminate its parking requirements for new hotel units within attached additions to contributing historic buildings on Lincoln Road. The concept is something the City’s Planning staff and the Commission’s Land Use Committee support examining further. Miami Beach Planning Director Tom Mooney told Committee members this past week, “What we’ve seen is that oftentimes [the parking requirements] can be an impediment because on Lincoln Road there’s no way to physically provide it on the building and there’s copious number of parking garages within the vicinity so then what the property’s owner is faced with is ‘Do I want to spend $40,000 a space on the impact fee” for not having parking. “More often than not, they just say ‘No, we’re not going to do the hotel,’” Mooney said. Sponsor Commissioner Ricky Arriola said, “I thought this project, in particular, was pretty cool looking.” Having just approved a 200 sq. ft. minimum hotel unit size proposed for the Collins Park neighborhood, Arriola said he was supportive of a similar reduction for Lincoln Road. The issue, Arriola said, is “What do we want to see on Lincoln Road? Do we want to see hotels or not? What’s the pros and what are the cons?” He also asked what the public benefit might be that property owners would contribute back to the community for being allowing to build hotels. Marrero said this idea has been kicking around for a while but it proved too expensive previously given the larger room size requirements and the parking impact fee that would need to be paid in lieu of providing on-site parking. The owner brought the plan back “thinking Lincoln Road needs an injection of something new and exciting,” Marrero told the Committee. Given the available parking garages in the area and the increased use of ride sharing services, he said, the elimination of parking makes sense. He emphasized the owner is “not planning to touch or demolish in any way” the “contributing” building. She urged “a bigger thought plan about Lincoln Road” beyond just the Sterling Building proposal. “After all, aren’t we still waiting to beautify that road?” she asked referring to the Lincoln Road Master Plan. “I think a boutique hotel with all that brings with it, not just guests but the small cafés and the small retailers that typically are there to service the guests is a good thing for Lincoln Road,” he said. Commissioner Joy Malakoff said she liked the concept for the Sterling Building and hotel uses on the north side of Lincoln Road. “I think the Sterling Building and what you’re planning makes a lot of sense. I have a problem with, perhaps, doing hotels on the south side of Lincoln Road. The north side, you’re facing a lane and commercial buildings and City Hall, a garage, etc. On the south side, I believe there are multi-family buildings and garden apartments” which she said could pose a problem. Committee Chair, Commissioner John Alemán, agreed. “I think you need to study the length of the street, all sides, and recommend where this applies,” she said to Mooney. “I do really like the idea about the retail incentive and how do we try to encourage an envelope for boutique retail whatever that looks like,” she said. The Committee will further review the ordinance at its May 22 meeting after staff takes another cut at it. Malakoff also suggested being mindful of Soundscape Park. “We have to be very careful because sound does travel.” She expressed concern with any outdoor rooftop activity or music interfering with audiences trying to listen to the popular Wallcasts. Alemán also noted the Miami Beach Community Church located at Drexel and Lincoln. “Be thoughtful and look at everything that’s out there,” she told Mooney. The initial draft ordinance can be found here.